Iran’s proxy Hizbullah must submit to a new arrangement in which its power is reduced, Lebanese Prime Minister Saad Hariri said on Nov. 27. Hariri, in an interview with French broadcaster CNews, said he would finalize his resignation if Hizbullah and Iran do not agree to re-balance Lebanon’s political configuration. Hariri also has demanded that Hizbullah remove itself from regional conflicts in Syria, Iraq and Yemen. Hizbullah denies playing a military role in Yemen but has fighters in both Iraq and Syria. Hizbullah is an opponent of Hariri’s Saudi Arabia-backed Future Movement, despite being a member of Hariri’s coalition government. 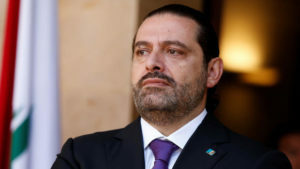 In a televised address from Saudi Arabia on Nov. 4, Hariri stepped down from his position, citing assassination threats, such as the one that took the life of his father — Prime Minister Rafic Hariri — as well as the negative impact of Hizbullah and its patron Iran on Lebanon and the region. After his announcement, Hariri remained in Saudi Arabia, leading to weeks of speculation that he was being detained there against his will. He then traveled to France, Egypt and Cyprus, before arriving back in his homeland and announcing that he was putting his decision to resign on hold ahead of negotiations.